Ho! How did I miss this? Someone told my that the child who started the San Diego measles outbreak last year was one of Dr Bob's unvaccinated patients. Is that true? That is so sad for the families affected by the outbreak, especially for the babies that were too young to be protected by the vaccine. So, it's totally my fault that the outbreak happened. No, seriously, I do know who the family is and have interacted with them. I'll leave it at that, since it doesn't actually matter if they were actually my patient or not. A recent study by researchers on the role of vaccine refusal in this outbreak was staggering: 839 people were exposed, 11 additional measles cases were reported (all in unvaccinated children); one infant, too young to be vaccinated, had to be hospitalized. At a time when the state of California is in devastating financial straits, it cost San Diego serious health care dollars: $10,376 per case, for a total of $124,517 (and the hospitalized infant's bill was nearly $15,000). Forty-eight children too young to be vaccinated were quarantined for several weeks, meaning parents had to miss work and wages at an average cost of $775 per child. Fortunately, all cases passed without complications, as is usually the case with measles. As a pediatric infectious disease physician I feel I must comment on statements made in your March 27th commentary on the New York Times article. First, you infer that the cases in San Diego did not constitute an outbreak ("...if you can call it that..."). This is a highly contagious infection that spreads by small droplets that remain suspended in a closed room for over an hour. Indeed, 4 of the cases acquired the infection just by being in the pediatrician’s office at the same time as the first case. Three of these were infants and one of them had to be admitted to the hospital for dehydration. Elsewhere you have observed that “all of the cases of measles passed without complications, as is usually the case with measles”. Let me share with you our experience with measles at Childrens Hospital Los Angeles during the measles epidemic in 1990. We diagnosed 440 cases between January 1st and June 30th. Of these cases 195 (44%) had to be admitted for one or more complications of measles. We documented the complications in all 440 cases and they included 63% with ear infections, 45% with diarrhea, 39% with dehydration, 36% with pneumonia, 19% with croup, and about 3% with other bacterial infections. Three children died all of pneumonia. Measles is not a trivial infection as you inferred. We would not be having a debate about vaccines at all if people realized the tremendous costs in suffering and human life we incurred before vaccines became available. To adequately protect a population against measles >90% of the population must be effectively immunized against the disease. If individuals defer vaccines as you suggest we will rapidly fall below that level putting large numbers of infants and children at risk of an outbreak if measles is introduced into the community. This is a free country but we should all feel some responsibility to our fellow citizens and their children. Thank you Dr. Mason, that says it all, really, about the irresponsible behaviour of Dr. Bob Sears (and the patients' parents who believe him). 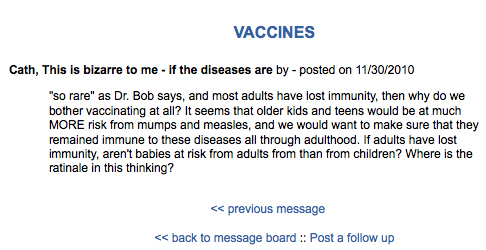 another Dr. Bob "gem", I am afraid. my kids are 3 and a half and 1- both boys. we live in ny, and they havent had any vaccines. i would like to eventually travel with them, normal family spots- carribean, europe.... would you vax if you were me, and if so, which would you do? thanks! Hypothetically, if I was a doctor answering a forum question pretending to be the person asking the question, my answer would be that I wouldn't do any vaccines just for disease coverage for the type of vacation travel that you, I mean "I", would be doing. The OP thinks that is a reason to "lol" - I think it is a reason to facepalm. Unvaccinated children travelling out of the US, for example to Europe, are the major source of importation of measles - last demonstrated by the San Diego outbreak. The index patient was an unvaccinated boy aged 7 years who had visited Switzerland with his family, returning to the United States on January 13, 2008. He had fever and sore throat on January 21, followed by cough, coryza, and conjunctivitis. During January 31--February 19, a total of 11 additional measles cases in unvaccinated infants and children aged 10 months--9 years were identified. These 11 cases included both of the index patient's siblings (rash onset: February 3), five children in his school (rash onset: January 31--February 17), and four additional children (rash onset: February 6--10) who had been in the pediatrician's office on January 25 at the same time as the index patient. Among these latter four patients, three were infants aged over 12 months. One of the three infants was hospitalized for 2 days for dehydration; another infant traveled by airplane to Hawaii on February 9 while infectious. Great job, who ever had suggested to the parents of that index case that it was ok to travel to Switzerland (in the middle of an ongoing measles outbreak with more than 3400 cases, 8 encephalitis and a pediatric death) with unvaccinated children. To suggest, even "hypothetically" that no vaccination was necessary to travel outside the US is highly irresponsible. Parents who leave their children unvaccinated when taking them into the middle of an outbreak potentially make their children murder weapons – we posted the story of the pre-teen who spread measles in a waiting room as a consequence of which two children are now dying a very slow and horrific death. The thread is entitled "Jaw problems after Tetanus vaccination". Mein Sohn (13 Jahre) hat sich am Knie eine mind. 1,5 cm tiefe Wunde zugezogen. Da es auch noch schmutzig war, (Sand etc.) habe ich den Hausartzt erlaubt ihn gegen Tetanus zu impfen. Er war bis jetzt noch gar nicht geimpft gewesen. 2 Tage später klagte mein Sohn das er sein Mund kaum öffnen könne, essen wurde schwierig, auch Zähneputzen. Alles ist verspannt, Kiefer und Hals tun Weh, vor allem beim kauen. Meine Frage ist jetzt, ob das eine Folge von Impfen sein kann, oder eine Zufall? Wenn, ist es alarmierend oder geht`s vorbei automatisch? Wäre heilfroh, wenn jemand Erfahrung hat mit sowas. Ich würde ungern zu den Arzt gehen, er ist Impffanatiker und ich kämpfe schon seit Jahren mit diese Thema. In the first post the mom describes that her 13 year old, unvaccinated son sustained a knee injury (1.5 cm deep, dirty, sandy) and because he had not been vaccinated, she allowed his GP to "vaccinate him against tetanus". Two days later, the boy has problems opening his jaw, neck and jaw hurt when he tries to eat or brush teeth. She fears vaccine damage and wonders whether this will pass alone. She is also afraid to take her son to the doctor, because he is "vaccine fanatic". "This sounds just like Tetanus Symptoms" (wait if you think "well spotted, now he is going to send her to the doctor") - he continues "I would assume that your son would not have gotten these symptoms without the vaccine. After all, Tetanus Toxins are injected. So it is not surprising that here we are looking at something like beginning Tetanus.".. Mum responds "That is just what I thought. So I probably did the wrong thing again. It is worse today. The boy can hardly eat. I will take him to the doctor at 6pm. I assume he will give a cortisone injection or something like that and tells me that he should have been vaccinated much earlier. I really don't know what to do. This has been going on for 4 days and for the child it is very irritating. If at least I knew this is going to pass. Well, at least I know for sure that none of my children will be vaccinated (this was the first time)." A poster called "Anke" confirms the mother in her feelings and encourages her to report this as an adverse vaccine event. She also claims to have "heard of such symptoms associated with the tetanus vaccine". A day later, she is taking her son to the doctor again. The doctor does not diagnose tetanus, but a throat infection and (because mom does not want him on antibiotics) she takes her son to the local pediatric hospital where he stays for observation. Doctors there think vaccine reaction AND tetanus are "unlikely". In the thread, a poster called "Uschi" then shares her experience with jaw problems which she assumes were from her tetanus vaccination, which she later "chelated with the help of her homeopath". "Gaston" pitches in with a terrible rant about the doctor. I feel like ranting about that doctor, after all, he did not diagnose the tetanus in a rather unambiguous presentation, but that is not what "Gaston" means. He is on a roll "if this was my child, I would do everything to hold this scumbag accountable. .../... The penicillin treatment, which is counter-indicated in this case, is the worst, because your son could have sustained further damage from it!" 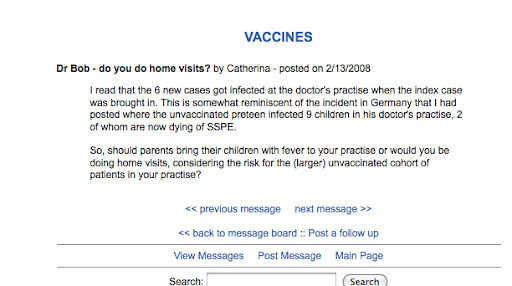 Most further posters share these sentiments, however, "Sonnenlicht" asks whether the boy had received active or passive immunisation, because post-exposure, the boy would have needed immunoglobulins. Four days have passed since the mum's first post. Finally, the child is transferred to the next large University Hospital as the doctors clue in that he has tetanus. The boy can still talk, but cannot eat or drink. In that post, mom also says that her son had the active and passive immunisation a week earlier (that post is on page 2 of the thread). She assumes, her son's illness is from either of the the two. Poster "Babsi" refers the mum to a vaccine-critical doctor in Bavaria. Poster "Kat" "knows" from her naturopathic pediatrician that the tetanus vaccine given "in case it has become serious, is particularly critical, i.e. badly tolerated." She is also adamant that if the wound had been bleeding "it is impossible that this was tetanus, it is vaccine damage!!!" (the three exclamation marks make it true, you know). Apart from that, she recommends a vaccine critical "expert" or "any naturopathic doctor for further help". "Gaston" totally shares her feelings. "The wound alone did not cause the problems, that was unambiguously the vaccine. It is generally known that vaccines cause the disease they are supposed to protect from in some. Some people are more susceptible for this." He suggests contacting the media "Tetanus after vaccination! Because Tetanus is really rare here in Europe." "Anke" pitches in and recommends Arnica globules in the 200C and consulting a homeopath. General rambling ensues. A day later we get a chronological account. It appears that the wound was cleaned and sutured soon after the accident, but the immunisations were not given until the control visit 3 days later. The tetanus symptoms started another couple of days after that, so 5 or 6 days after the injury. Mum reports "Everyone in the University Hospital is convinced that he has tetanus from the wound, although it cannot be proven. I do believe it, too. The wound was very deep and got sutured = closed air tight. This disease is very rare. Even in the University Hospital no one had ever seen a single case. My son is better today. He was released from ICU and is on a normal ward now. He can still not open his mouth, but he could drink a little bit." After this account, "Sonnenlicht" is also convinced that the tetanus was caused by the wound and that tetanus is an important vaccine after all. However, "presonic" would still not vaccinate in such a situation. S/he doesn't understand why "the dead flesh was not removed before the wound was sutured.". "Sonnenlicht" does not buy that. "Anke" just cannot believe that such a wound did not bleed profusely and the mother explains that her son had a bicycle accident on an asphalted path and a deep wound next to the knee that did bleed. She is unsure whether the doctor cleaned the would appropriately. Two weeks later, we get the resolution that the boy is home again, after nearly two weeks in the hospital on antibiotics, tetanus immunoglobulins and "lots of other medicines". The mother describes that her son had "not fared as poorly as she was told to expect" - he could breathe on his own and did not get "bad" cramps. He could not open his mouth and his tongue hurt. He started to make an effort to eat when the doctors discussed giving him a stomach probe to feed him. This story is shocking on several levels. Obviously, I pity the child. An injured knee should not put a 13 year old in the hospital with tetanus. He was obviously very uncomfortable the whole time and mum sounds very desperate, too. The doctors' reactions in hindsight (which is always 20/20 ;)) were not stellar, the reaction of the resident anti-vaccine posters on that board are so out-worldly that they look almost staged. They may even have contributed to the delay until the boy was taken to the hospital. Tetanus in children is very rare - so rare in fact, that doctors do no longer necessarily clue in when they are faced with a child with a locked jaw. However, 80% of the few pediatric cases of tetanus occur in unvaccinated children. They don't need dramatic injuries, blunt trauma, or minor splinters can be enough of a cause. Tetanus in children is very rare, however, we need to remember that most toddlers (over 96% according to the latest US figures, European figures are similar) have had at least 3 vaccines against tetanus - protection up to the school booster is near perfect, see also here, and most kids in the US will get that first school booster that protects them into adolescence, when 75% of US kids are getting another booster. So the bottom line is: parents who do not vaccinate against tetanus need to be aware that the low incidence of tetanus is in part due to the high vaccination coverage. They themselves need to keep tetanus in mind when their unvaccinated children have an accident, since doctors might not automatically assume that s/he is looking at one of the 4/100 children who does not have tetanus protection and will almost certainly not have experience with tetanus. 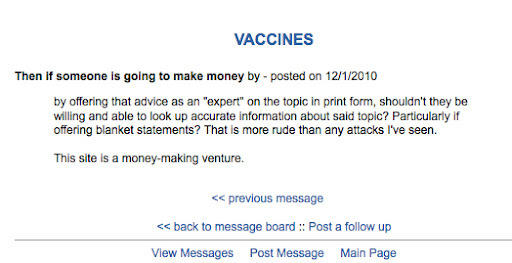 If worrying about tetanus with every splinter is too stressful for the parents, the alternative is NOT to post on an anti-vaccine board for encouragement that "head in the sand" is the best option, because 1. vaccines are teh ebil and 2. they are particularly evil after exposure. The reasonable alternative is to consider vaccination. Media, TV, newspapers, but also online communities and blogs shape our opinions on health topics (all topics, really). In this busy world, we rarely take the time to read much beyond the sensational headline and the first couple of paragraphs. This is a dangerous trend, news items rarely contain the full information, journalists often cherry pick information from an original source and "fit" it to the desired headline (as eloquently described by Ben Goldacre here). Caveats and disclaimers are most often hidden at the bottom of the piece (Ben Goldacre again). References to original sources/publications, if they are given, are tedious to follow up. The whole exercise follows a stereotypical goal oriented (and the goal is NOT information) pattern (wonderfully spoofed by Martin Robbins here). Evidence based bloggers, some online media and universities are pushing for less sensationalistic and more factual reporting. Recently, a campaign to add a "report an error" button to each news page was launched. Britain's National Health Service even runs a "Behind the Headlines" page that explains what is really in that paper. Correlation does NOT imply causality (or causal relationship). We would probably suspect the (fictional) media headline "Storks deliver babies", based on the (true) fact that number of storks in Europe is strongly correlated with the local birth rate (the p-value is an impressive 0.008) wasn't true. But what about the many other health headlines, that tell us which herb/behaviour cures which disease, what is best for baby, what is best avoided for baby? Vaccines cause autism? Enter Stat Girl, who "skewers the news, reminding the world that correlation is not causality one headline at a time". With this "agenda" in mind, she is tackling the issues and outlets that target young mothers with their headlines. Visit her blog and say "hello"! We need more analyses of media content and pressure for better reporting. How cool is that? 53 out of all books. God has really answered my prayers of wanting to reach America's (and England's too, Catherina) families with complete and objective info about the all-important decision. Yeah! 2 doses are still required, BUT one dose, in my opinion, is all that is really needed. One dose gives full protection from measles in 95% of kids, mumps in 98% of kids, and rubella in 99% of kids, regardless of age of vaccination. So, I think one dose is good enough. Getting it older, such as age four, MAY be more effective than getting it younger (such as age one), but I don't know a lot of details on that. The ONLY reason we do two doses is to try to get the 5% who don't respond to one dose for measles to get protected from the second dose (most do respond to the second dose). That's better for public health/herd imunity, but as individuals I think one dose is fine. 2 doses are still required, BUT one dose, in my opinion, is all that is really needed. : really? Enlighten us, why you have come to a different opinion than health experts in any other country in the world, based on "complete and objective info"? One dose gives full protection from measles in 95% of kids, mumps in 98% of kids, and rubella in 99% of kids, regardless of age of vaccination. : I think, contrary to what he claims, Bob does read our blog. So, I think one dose is good enough. : This from the man who claimed earlier this week that "most adults had lost their immunity". And how are his "thoughts" supported by "complete and objective info"? Getting it older, such as age four, MAY be more effective than getting it younger (such as age one), but I don't know a lot of details on that. : Getting it older, such as age four, MAY be more effective than getting it younger (such as age one), but I don't know a lot of details on that. There, fixed that for you. Honestly, someone is pushing a vaccine "strategy" that will leave millions of kids unprotected, based on lack of knowledge?! Anyone else scared yet? I am. The ONLY reason we do two doses is to try to get the 5% who don't respond to one dose for measles to get protected from the second dose (most do respond to the second dose). : And that is not a good reason already? Apart from the fact that mumps immunity is now thought to wane and needs boosting to maintain high community immunity (see for example here). That's better for public health/herd imunity, but as individuals I think one dose is fine. : Really? Because his readers/patients all live in a bubble? We have already let our a collective gasp at the "don't tell your neighbors if you are eroding their safety by following my home made advice", but the above statement reveals fundamental misunderstanding of the workings of herd immunity and basic concepts of public health paired with the confident call for selfishness that tops his previous "insights". Remember? Bob claimed to provide complete and objective info. Gut feeling based on hanging out with the anti-vaccine crowd too much, amplified into the Gospel by a deluded sense of being The Chosen One seems much closer to reality. does that mean that we would have to re-vaccinate when child is 14 or older? (Having been originally vaccinated at age 4). Will the one MMR not last a lifetime? Or would we just check titers again after the ten to fifteen year mark? I'd check titers. It's fairly unpredictable and individual as far as how long titers will stay positive. You could check every 5 years starting around age fifteen. OR, knowing that the diseases are so rare, you could just not bother after checking at fifteen. MOST adults have lost their imunity, and no one checks (unless a person's occupation requires it, or during pregnancy for rubella). I'd check titers. : Yes, you would, as a doctor in private practice, that sounds like a very attractive way forward. Not sure how appealing this is to parents and children, though. It's fairly unpredictable and individual as far as how long titers will stay positive. : It is funny he should say that, when the current Dr. Bob recommendation is to vaccinate children once with MMR when they are four since that is sufficient then ("for State requirements", in the small print). You could check every 5 years starting around age fifteen. : A blood draw and expensive titers (not sure how expensive, but his vaccine visits cost $80 to $200) every five years, mmh, ok.
Why are M, M, and R rare? Because of the 2xMMR vaccine policy in developed countries. What will happen if everyone followed Dr. Bob's recommendation? M, M, and R would resurge - his 1xMMR vaccinated patients would provide the ideal breeding ground. 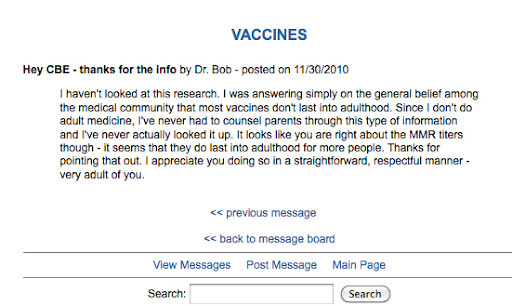 Dr. Bob's home visits for measles patients do not come cheap. 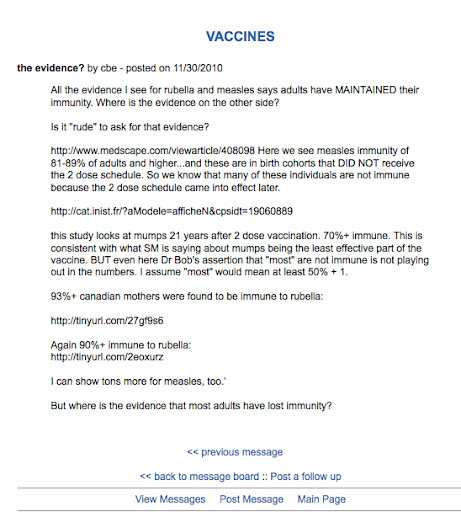 All the evidence I see for rubella and measles says adults have MAINTAINED their immunity. Where is the evidence on the other side? Is it "rude" to ask for that evidence? http://www.medscape.com/viewarticle/408098 Here we see measles immunity of 81-89% of adults and higher...and these are in birth cohorts that DID NOT receive the 2 dose schedule. So we know that many of these individuals are not immune because the 2 dose schedule came into effect later. this study looks at mumps 21 years after 2 dose vaccination. 70%+ immune. This is consistent with what SM is saying about mumps being the least effective part of the vaccine. BUT even here Dr Bob's assertion that "most" are not immune is not playing out in the numbers. I assume "most" would mean at least 50% + 1. But where is the evidence that most adults have lost immunity? I haven't looked at this research. I was answering simply on the general belief among the medical community that most vaccines don't last into adulthood. Since I don't do adult medicine, I've never had to counsel parents through this type of information and I've never actually looked it up. 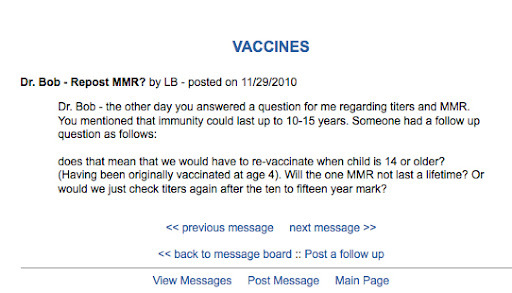 It looks like you are right about the MMR titers though - it seems that they do last into adulthood for more people. Thanks for pointing that out. I appreciate you doing so in a straightforward, respectful manner - very adult of you. I haven't looked at this research. : now that was blindingly obvious. I was answering simply on the general belief among the medical community that most vaccines don't last into adulthood. : I was answering simply on the general belief I didn't bother to look up the evidence before I posted utter nonsense in the forum (there, I fixed that for you). Since I don't do adult medicine, I've never had to counsel parents through this type of information and I've never actually looked it up. 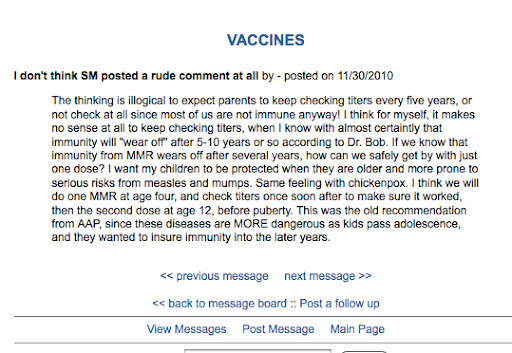 : So Dr. Bob doesn't consider the consequences of his "alternative vaccination schedule" for his patients when they become adults? Wow. 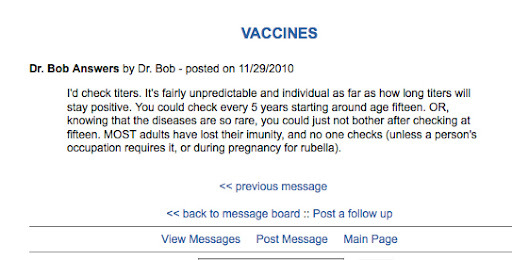 "so rare" as Dr. Bob says, and most adults have lost immunity, then why do we bother vaccinating at all? It seems that older kids and teens would be at much MORE risk from mumps and measles, and we would want to make sure that they remained immune to these diseases all through adulthood. If adults have lost immunity, aren't babies at risk from adults from than from children? Where is the ratinale in this thinking? The thinking is illogical to expect parents to keep checking titers every five years, or not check at all since most of us are not immune anyway! I think for myself, it makes no sense at all to keep checking titers, when I know with almost certaintly that immunity will "wear off" after 5-10 years or so according to Dr. Bob. If we know that immunity from MMR wears off after several years, how can we safely get by with just one dose? I want my children to be protected when they are older and more prone to serious risks from measles and mumps. Same feeling with chickenpox. I think we will do one MMR at age four, and check titers once soon after to make sure it worked, then the second dose at age 12, before puberty. This was the old recommendation from AAP, since these diseases are MORE dangerous as kids pass adolescence, and they wanted to insure immunity into the later years. by offering that advice as an "expert" on the topic in print form, shouldn't they be willing and able to look up accurate information about said topic? Particularly if offering blanket statements? That is more rude than any attacks I've seen. This site is a money-making venture.